This Bacon Cheeseburger Hamburger Helper® is brought to you in collaboration with Hamburger Helper® to help bring you easy hamburger recipes this summer! As always, the recipe and opinions in this post are my own. May was National Hamburger Month and the start of hamburger season! Hamburger Helper® wants you to make and share your favorite hamburger recipes that are quick and easy to prepare. I decided to spruce up the Bacon Cheeseburger flavor of Hamburger Helper® that I picked up at Walmart, adding in more of the typical bacon cheeseburgers you might expect when ordering one! 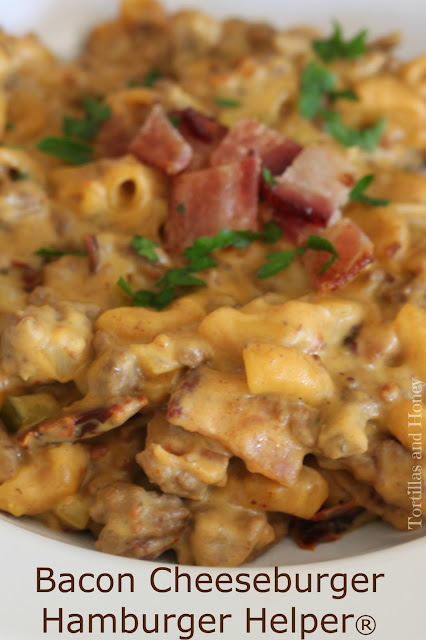 This Bacon Cheeseburger Hamburger Helper® takes less than half an hour to prepare and includes ingredients that you're likely to already have in your pantry! And there's no heating up the grill! To make this recipe similar to what you might expect when eating the real thing, I added in many ingredients in your typical bacon cheeseburger! I added in some onions with the hamburger as it was browning, then used a can of evaporated milk to make the sauce more creamy. I decided to add in sun dried tomatoes instead of fresh tomatoes because I like the concentrated flavors of sun-dried tomatoes and I wasn't too sure how fresh tomatoes would hold up in the pasta. I also added in some stoneground mustard to the sauce. After the pasta was finished cooking, I added in chopped bacon, finely diced dill pickles and raw onions. I also stirred in some fresh parsley at the end to give the dish a little bit of freshness in lieu of the using lettuce. I really liked how the pickles and raw onions really mimicked the flavor of the toppings you get with a cheeseburger. You can definitely alter this recipe to fit your tastes! I hope your give this easy and fun recipe a try! What type of hamburger dishes do you like to make your family in the summertime? In a large skillet, brown the ground beef and 2/3 of the diced onion. Once the ground beef is cooked through, drain the grease from the skillet. Add the contents of the package of the Hamburger Helper® (pasta and seasoning packet), evaporated milk, milk, hot water, and sun dried tomatoes. Stir all of the ingredients together until combined. Bring the mixture to a boil, then cover and lower the heat to a simmer for about 10 minutes until the pasta is soft. Stir in the diced dill pickles, bacon, parsley, and the remaining raw onions. Scoop into bowls, and serve.